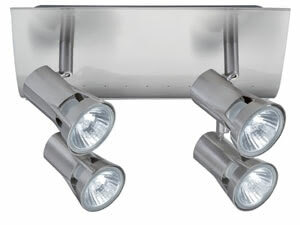 The 4-lamp -Teja- spotlight features proven 230В volt halogen technology combined with an attractive design. The product includes a lamp, halogen Akzent 50В W GU10 230В V 51В mm satin (83642), on delivery and is suitable for wall and ceiling mounting. Thanks to the relatively concentrated light distribution, the product is particularly well-suited to the illumination of pictures and objects.